I thought I was gonna look good on just my wedding dress (isn't this every bride's dream?) 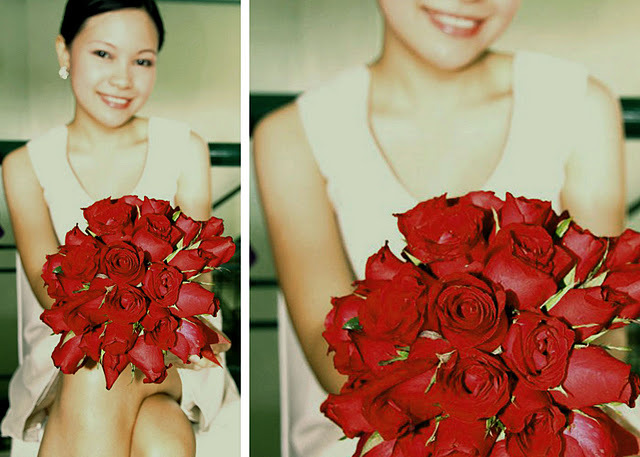 but darn, that bouquet of red roses was the perfect accessory! It added color to an otherwise dull look -- a white dress with white heels. The bouquet even upstaged me to an extent as the photographer wanted nothing but to snap pictures of that darling little bunch of flowers. Who could blame her? They were freshly-picked and the color, so lovely you'd be able to spot it on my hand from a mile. Thanks Aprille, super great job! Check out Nina's flowers here.